WACO — Once again, the conference crown and Big 12 bling will be worn by Texas’ Longhorns. All-American outside hitter Micaya White had 17 kills to lead Texas to a 22-25, 25-19, 25-22, 25-14 victory over Baylor on Friday night. With the victory at the Ferrell Center, Texas secured the Big 12’s outright championship. The Longhorns, who earn rings for winning the conference title, have won seven of the Big 12’s last eight championships. 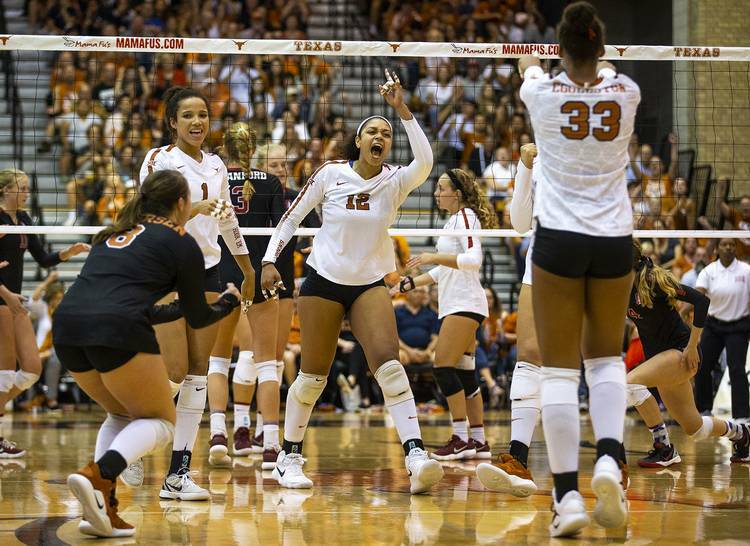 Texas (18-4, 13-1 Big 12) had taken the first set in each of its last seven matches, but that streak ended on Friday. With green-lit tubes flickering and being waved throughout an announced crowd of 3,016, Baylor senior Aniah Philo recorded five of her match-high 18 kills in the opening set. Baylor (18-8, 10-5) hit .375 against a Texas defense that gathered only one team block. Texas rebounded by scoring seven of the first eight points in a second set it never trailed in. The third set featured 15 ties, the last of which was recorded at 18-18. Key kills from White and Johnson gave UT some breathing room, and freshman Logan Eggleston found a hole in the Baylor defense for the final point. Boosted by two early blocks from Johnson, Texas blew by Baylor in the final set. After a replay overturned what was initially the match point, senior Yaazie Bedart-Ghani secured the championship with a kill. In addition to White’s 17 kills and .326 hitting percentage, Texas was also the beneficiary of a 13-kill evening from Eggleston. In her first appearance on the road as a starter, freshman Jhenna Gabriel distributed 47 assists. The UT defense was led by Johnson’s five blocks and Sydney Petersen’s 16 digs. All-time, the Longhorns own an 83-2 record over a Baylor team that last beat Texas in 2001. Ranked fifth in the AVCA’s poll for the last two weeks, Texas has two games left on its regular-season schedule. The Longhorns will travel to Lubbock next Wednesday before West Virginia arrives in Austin for the Longhorns’ Senior Day on Nov. 24. As the regular season winds down, Texas has been giving its players shorter practices and more time to rest. With a chance to grab one of the NCAA tournament’s top four seeds and conceivably host the first four rounds of the postseason, however, the Longhorns don’t plan on taking their foot off the gas next week.